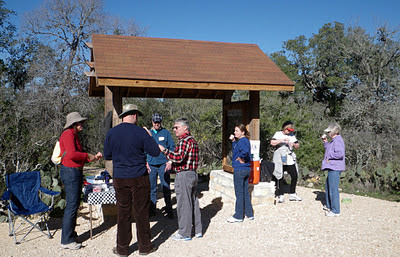 The San Marcos Riverwalkers 5 km and 10 kilometer hike Saturday, Jan. 14 was a resounding success with 171 registered hikers. The annual event drew participants from around Central Texas. Both courses utilized the 0.9 mile ADA trail at Spring Lake Preserve and then coursed through the neighborhood above Texas State University. Barbara Piersol, AVA chapter president and event organizer, incorporates trails in different natural areas each year. The last two years included Prospect Park, and the year-round hike uses the San Marcos River as an attraction. Saturday morning started off above freezing but as the sun rose so did the temperature, making for a pleasant hike. Many comments were made by the hikers about the attractive trail system and local residents wanted to know how long it had been there. Migrating robins continued to jump from treetop to treetop at the crest of the natural area.